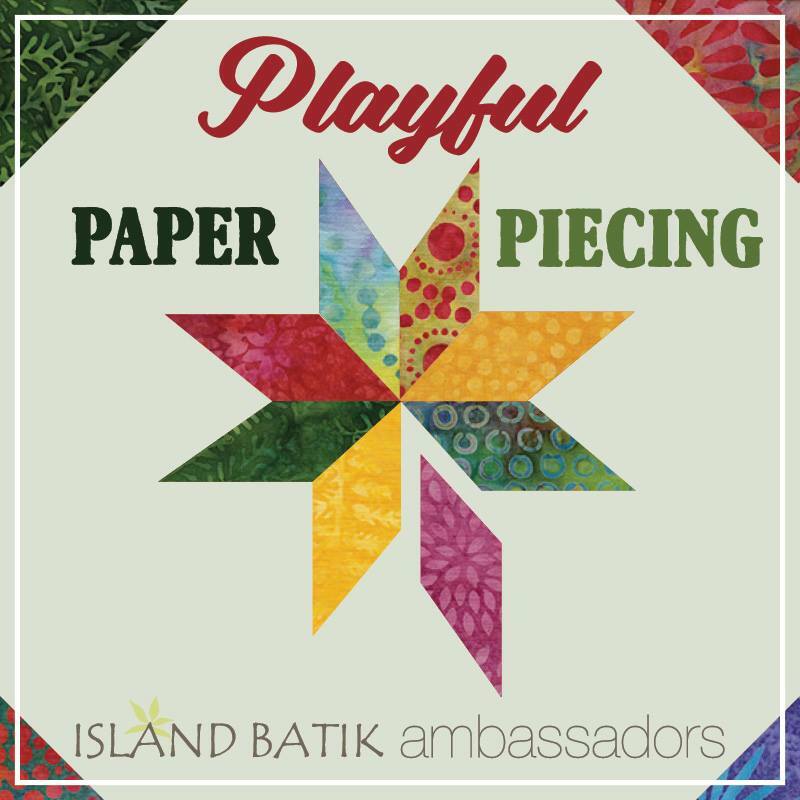 The Island Batik Ambassador's theme for May was to use a paper piecing method in your fun project. The title of this post comes from the fact that I made my piece with the idea of using it for this project as well as an auction item due early in June for a guild fund raiser. That is fun, trust me. 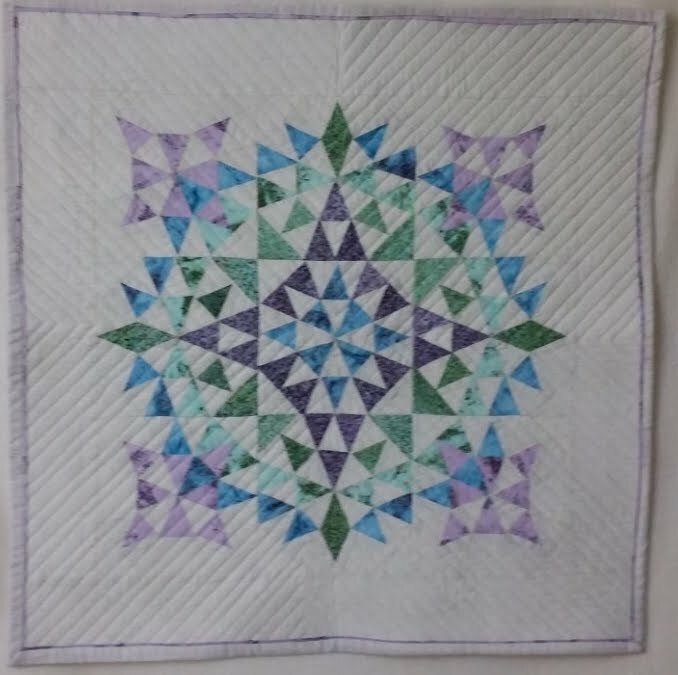 The mini quilt that I came up with uses the Southern Star quilt pattern from Ellison Lane's Jennifer Mathis. 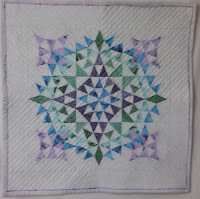 The pattern is a free download of a kaleidoscope block. 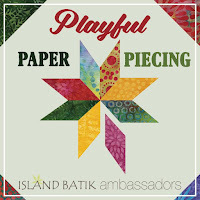 I have done paper piecing many times, but never a kaleidoscope. I dug deep into the dresser drawer that holds my Island stash, and the fabrics were left over pieces of the Sea Salt Sandy line from my fall Ambassador's box. There are several versions of this really pretty star on Pinterest and Instagram, and you can use many color layouts to play with. There was a mini quilt swap held by cotton and steel last fall, and that was my inspiration. The name of the piece is The Softer Side. The star is a 9 patch, with each of the blocks having 36 segment s - so it's intricate (and a perfect pp project). I think that in the beginning I spent more time on the layout than I did on the actual piecing. Once I got started, we moved onto assembly line sewing, and we were good to go. Did I mention that each block has 36 pieces? The background fabric may have looked as if it's solid, but it's actually white with a gray/green dot. I had several options for quilting thread thanks to my Aurifil stash, and it turns out that 2800 (the top spool below) was the perfect choice. I worked with a new (to me) binding technique on both this piece and the last Ambassador's project, and I am loving it - it's called the Magic binding technique. I'd been hand sewing my binding on for a long time, and I think this might be a chance to stretch myself creatively. I will be posting a run through on the technique on next week's blog. I will say that I lucked out because when I finished the binding, I literally had less than 5 inches left of the lavender. This piece is going up for Auction on June 6th, for the benefit of the New England Quilt Museum. If you have any interest in bidding on it, please contact me. I'm going to be making this pattern again! How do bloggers do it?? ?